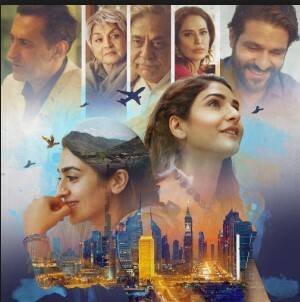 Pinky Memsaab is a Pakistani film that was released in 2018 and I got a chance to see it last night on Netflix. The simple story of a gullible village girl who goes to Dubai to work as a maid and support her family is a wonderful reminder that big budgets and complicated dialogs are not required for a film to hit home. The story, script and setting of the movie is realistic and gripping. The charm of the story is in its simplicity and how attention is paid to little details. The story is female-driven and refreshingly doesn’t have a specific romantic angle. Pinky wants to improve her life and that of her family. She does not need a male to rescue her and is the hero of her own story. All actors fit and own their roles. Hajra Yamin shows us the vulnerability and strength of Pinky. I loved Kiran Malik as Mehr, the trophy wife, fighting her own demons. I’m a long-time Adnan Jaffar fan and as always he does full justice to his role as the successful investment banker struggling in his roles as father and husband. It was a delight to see Islamabad in the story alongside Dubai. Any one from either of these cities will relate to some favorite corners and settings. The movie covers important topics such as class differences, self-discovery and family. Pakistani cinema is definitely making its mark and will find a path of its own if it continues exploring stories that are uniquely ours. Just last night, Pinky Memsaab won the audience choice award at the UK Asian Film Festival, and makes us all super proud. Looking forward to more amazing Pakistani content on Netflix and Amazon Prime.